The weather did a U-turn and suddenly it was mid-summer again. 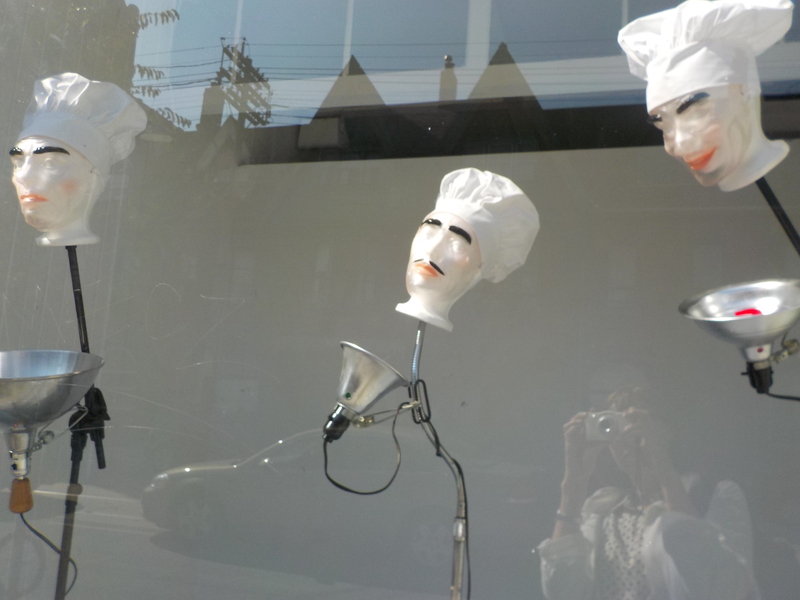 I exited the hot, packed Dufferin Bus at Queen Street and headed east. Throngs of people crowded the sidewalks as the sudden heat created a carnival atmosphere on this Saturday afternoon. 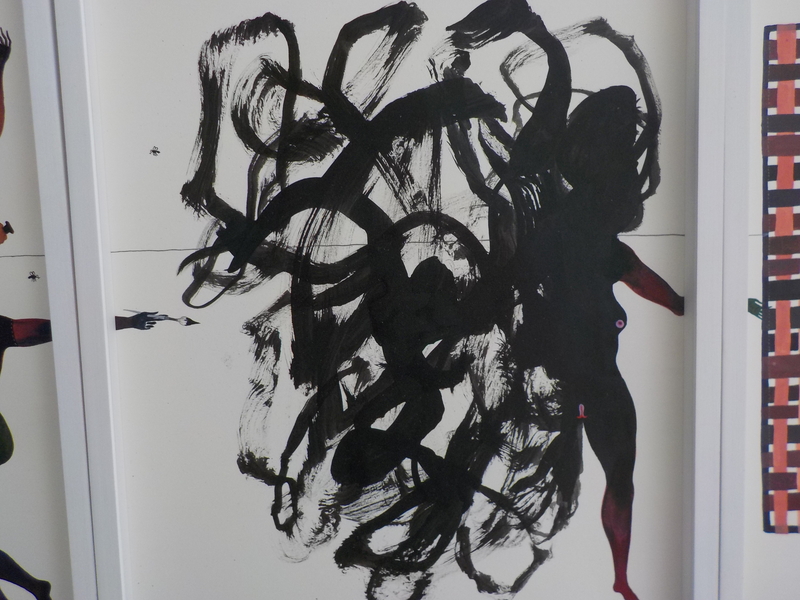 The feeling carried through to the Patrick Lundeen’s exhibition at Katharine Muherin Contemporary Art Projects. The paintings and assemblages in the show appear to reference African or Australian aboriginal art in their careful application of dots and stripes of color but more certainly the work is all about pop culture. In this case the artist is in Stephen King territory. You can almost here the screams behind the fun-house laughter as he explores the pyschological potholes of clowns, extra pointy fingernails, crumpled asses and howling faces. 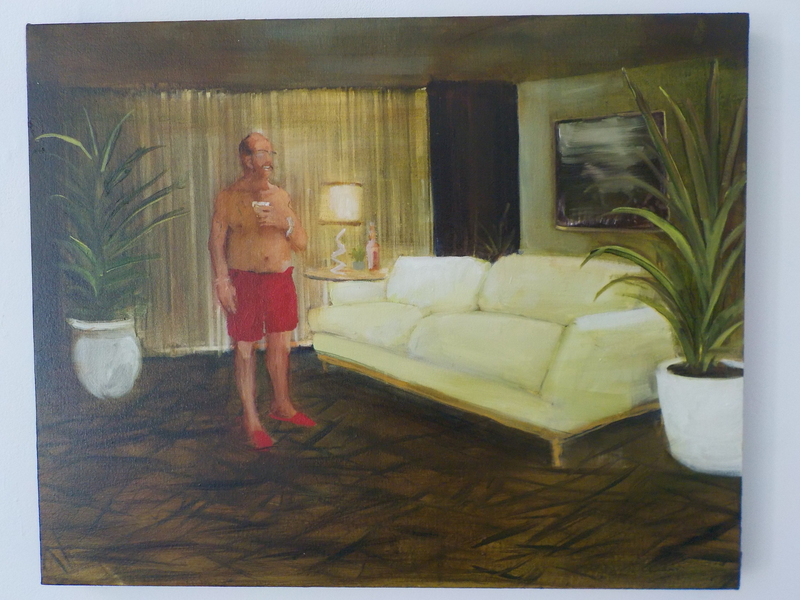 This artist is very skilled at conjuring up uncomfortable feelings. 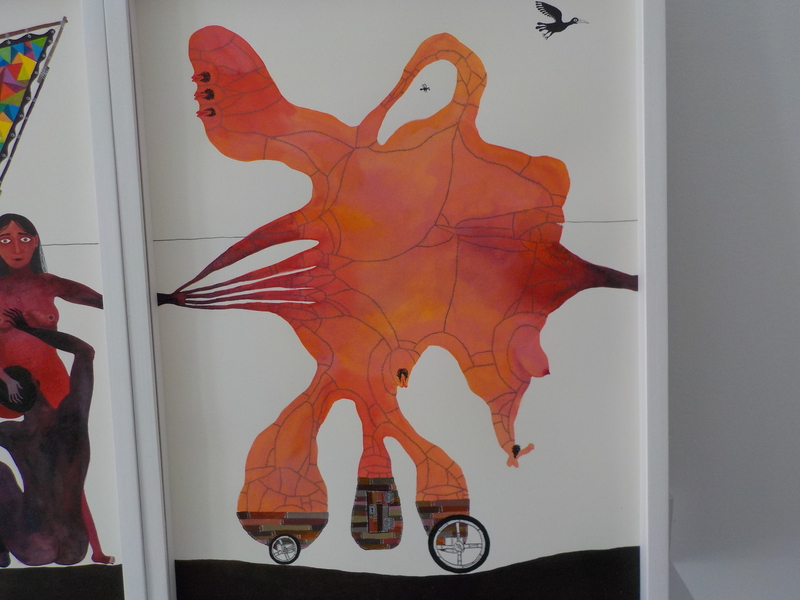 Lively, inventive drawings by Balint Zsako are displayed in the storefront. 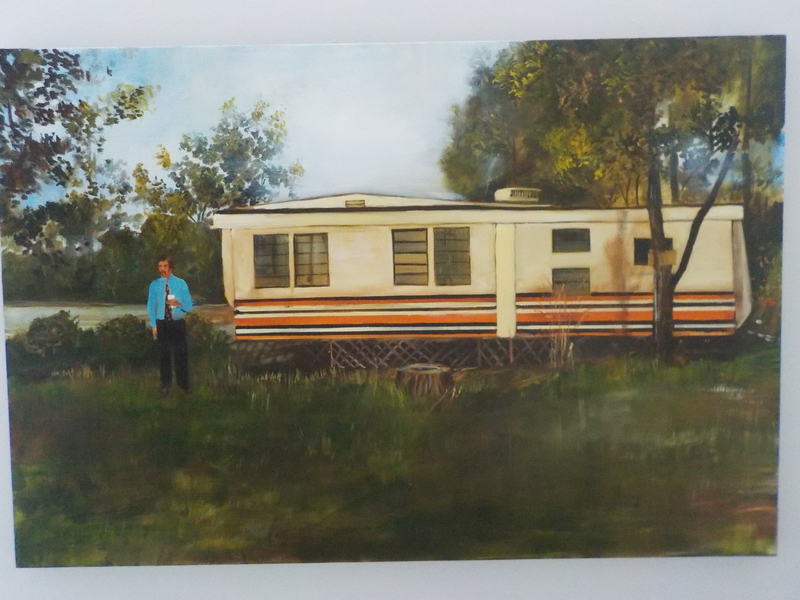 And, in a secondry room are Michael Harrington’s beautiful oil paintings which depict men statically posed beside their possessions: a rusty looking trailer, a shiny new SUV, a mysteriously glowing couch. Drink in hand, these guys are caught between pride and despair as they consider their material achievements. Duane Michals is a celebrated artist shown in prestigious institutions around the world. I was thrilled to see the narrative series “The Fallen Angel” from 1968. 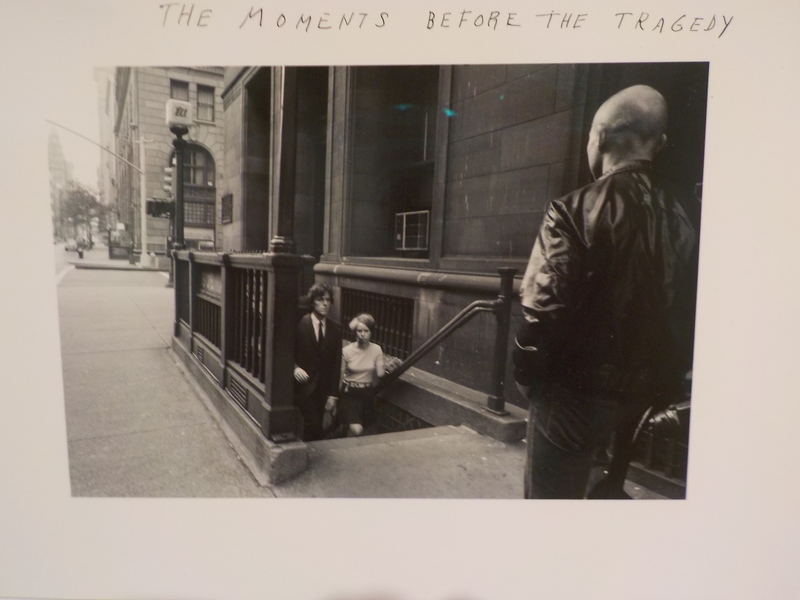 This sequence of photographs, and another from 1969 titled “The Moments Before the Tragedy”, read like the best kind of short story: filled with emotional complexity, intelligence and beauty. 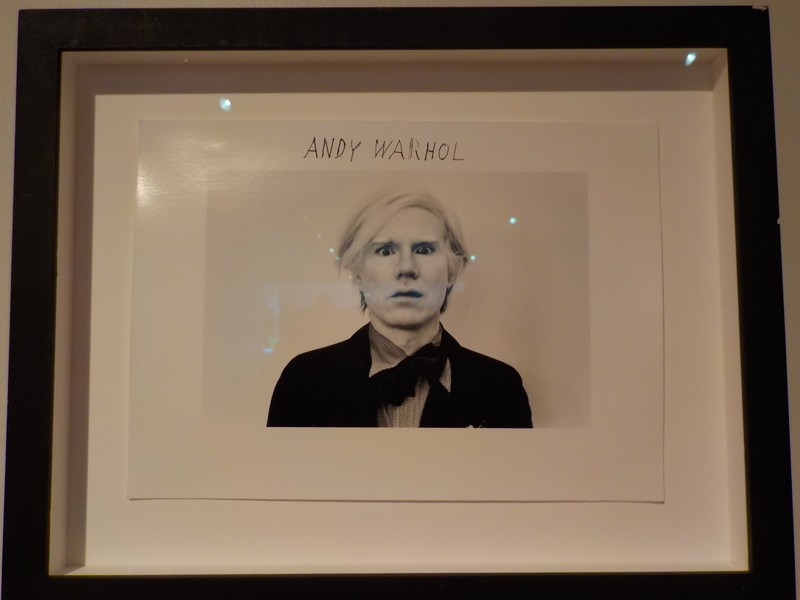 I checked the price list and found that a snapshot size photo of Andy Warhol by Duane Michals goes for 50,000 CAD. 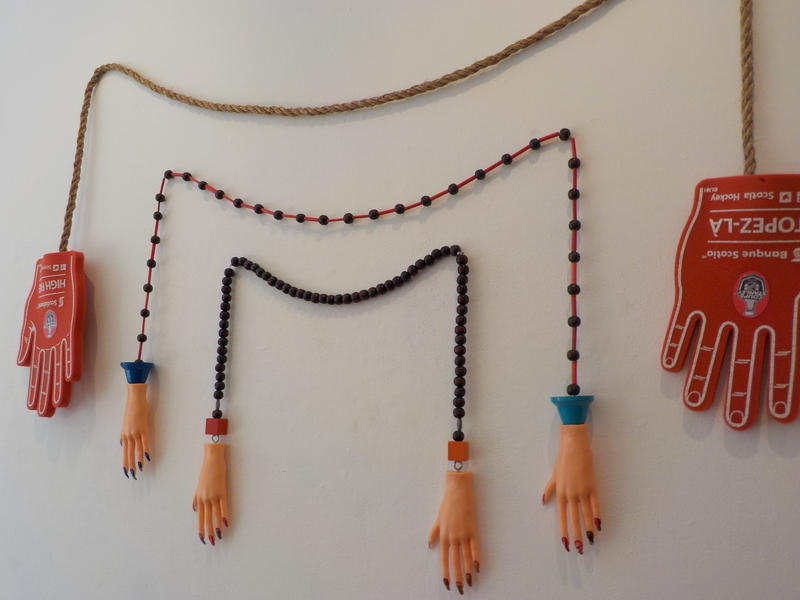 There is a fascinating piece, however, in the foyer of the exhibition by Public Studio. 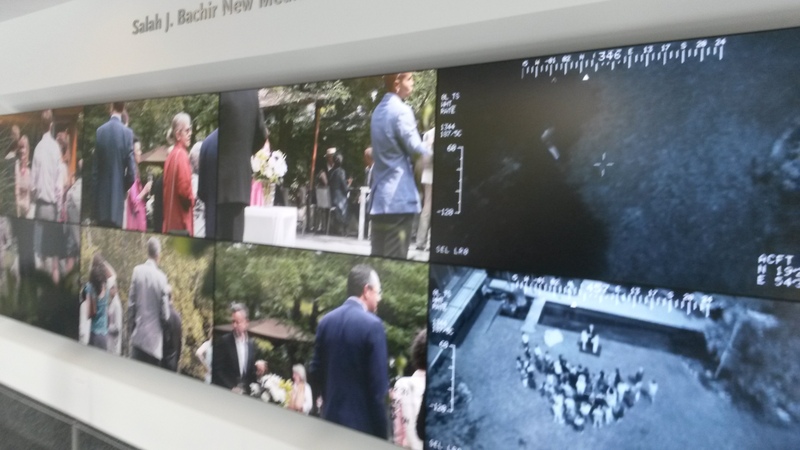 It’s called “Drone Wedding” and it consists of eight channels of video commissioned for the Salah J. Bachir Media Wall. A traditional montage of a radiant bride and groom and a few dozen guests during a ceremony in some verdant, tranquil Western setting is interspersed with the “negative” images of the event: ghostly blue infrared surveillance footage, a crackling military jargon soundtrack, eerie targetting and identification technology are all on display. How often have we heard a news snippet about an Afghani or Iraqi wedding party slaughtered when a drone mistakenly went in for the kill? Drones are the univited guests at this happy occasion. 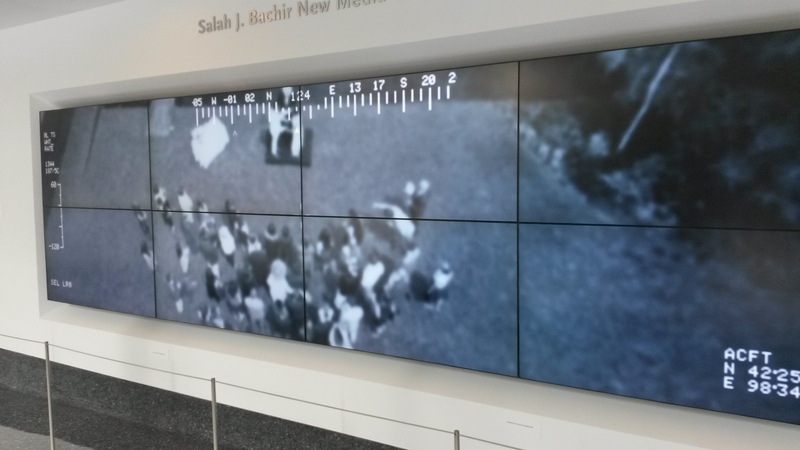 The artists comprising Public Studio, Elle Flanders & Tamira Sawatzky (and sometimes others), have stated they aim “to provoke conversations about surveillance and warfare” and they have created a chilling piece on those topics.